When a curmudgeonly customer is murdered outside the Honeybee Bakery, Uncle Ben becomes the prime suspect. With the help of handsome journalist Steve Dawes, charming firefighter Declan McCarthy, and a few spells, Katie and Aunt Lucy stir up some toil and trouble to clear Ben's name and find the real killer. 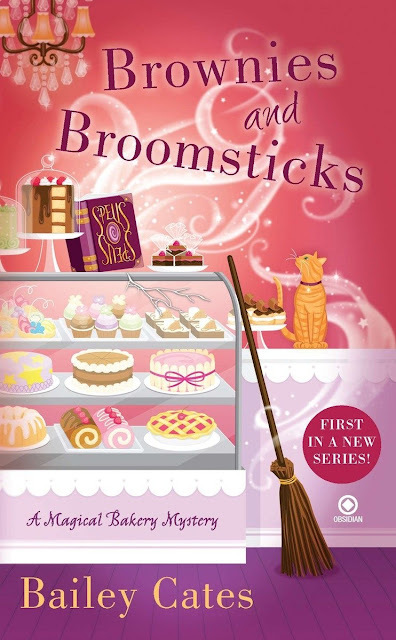 Brownies and Broomsticks was just what I was looking for - finally a paranormal themed cozy mystery that isn't all fault fluff and unrealistic rigidity. The main character has returned to a small town to escape her current life and start a anew in a bakery business with her aunt and uncle. Once there she finds out that she is in a long line of "hedgewitchery" and that the local book club is actually a type of coven of unique witches. Besides being charmed by the series detailed deserts (and the generous recipes at the back), it's a interesting with the magic. The book keeps it simple since she's an amateur trying the magic on for size, but I love how the aunt puts in herbs and various spells into the baked goods in terms of what a customer needs or wants. The club is comprised of witches from different backgrounds, some more on the light side than others, which makes it interesting and not too generic. Being a cozy, it's definitely a feel good story that doesn't break too many rules, but it's a cut above most of the paranormal themed I've read. Not too sugar sweet and a nice blend of characters. Unfortunately there's a small love triangle brewing - I'm definitely team Steve! Have to love the dog too.